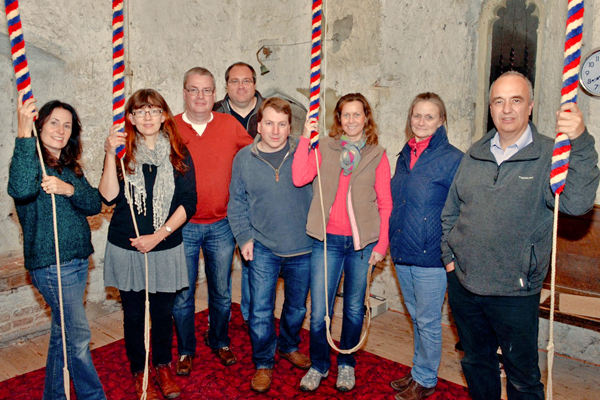 Bell ringing is a team activity that stimulates the brain and helps keep you fit …it also makes a glorious sound. Bells are used throughout the world during religious services. However, in England during the 1600's, a way of ringing Church bells developed that made a sound completely different from anywhere else in the world. Although practised throughout the United Kingdom, of the 6000 or so Churches with change ringing bells, only 215 are in Wales and only 20 in Scotland. It is a peculiar English tradition. Bell ringing music is like no other. It is not written on a standard score, is performed entirely from memory and is learnt by the path of the order that each bell sounds. Each bell is a different note in the music scale, the sequence starts with the highest note and ends with the lowest note. This sequence is repeated over and over again. 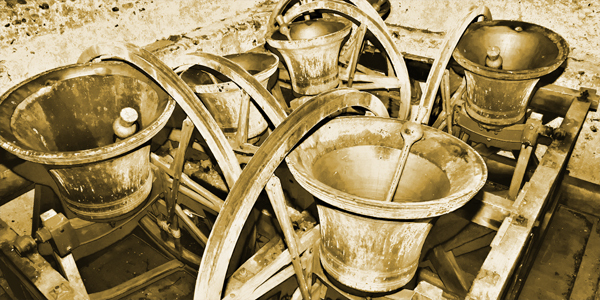 To generate a more interesting sound, the order of the bells can be changed hence the name "Change Ringing". Ringers are proud to continue this old tradition, passed down from generation to generation by hands on tuition. Learning can be fun - you can reach new heights hanging on to the "Sally". All photo's courtesy of Mike Harding. From 1600, rules soon evolved and changes could be worked out, written down and learned by heart to create patterns where the bells are never sounded in the same order twice. These compositions were named methods and soon hundreds were created, often named after the cities they were first rung in such as Norwich, London or Cambridge. The first true peal (an extent of ringing with over 5 000 different variations in) was believed to have been rung on May 2nd 1715 at St Peter Mancroft, Norwich. So here in Norfolk, we are at the very heart of the history of bell ringing. At Grimston, there are 6 bells dating from 1816. They are tuned to F, Eb, Db, C, Bb, and Ab and at Great Massingham they have 4 bells from 1903 and they are tuned to C, B, A,and G.
The Bell Ringers practice on Tuesday evenings at Grimston from 7.30pm to 9pm and at Great Massingham on a Friday from 7.30pm to 9pm. We are a very social team and have a lot of fun together. We can usually ring the bells at either church for any special occasion that can be requested ….. weddings, special services and any other event that may be happening. New members are welcome to come and visit and have a go. Really all we ask for is commitment and willingness! Ages from 16 to 99 male or female. 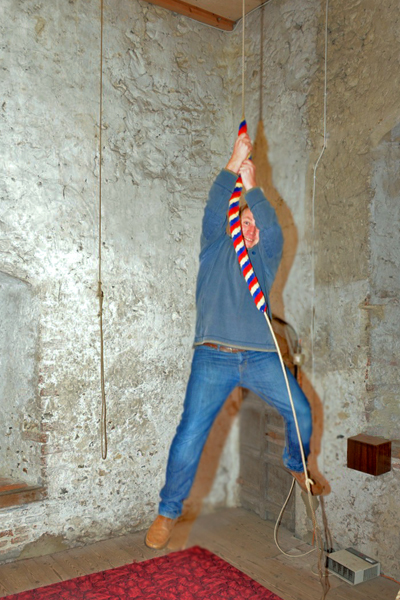 Bell ringing is more about the skill of control over the bell and not strength! or Denny Winner is the next best contact for the Massingham side....01485 520598.